TV Journalist Farhan Ahmed Bangash has walked into free world after a high court judge in Peshawar ordered January 1 his release from prison on bail following Kohat police charging him with terrorism. “I am released on bail on January 4,” Farhan told Freedom Network [FN] by phone from hometown Kohat, 65 kilometres south of Peshawar, on January 5, 2014. The young journalist was arrested on November 20 last year under terrorism and other criminal charges for his alleged role in November 18 sectarian violence in Kohat. The journalist had denied the charges. “Police has not tortured me physically, but mentally, yes,” he spoke of 15 days captivity with police adding that he was kept in small room with 17 other alleged criminals. Justice Mussarat Hillali of Peshawar High Court ordered his release for Rs.3,00,000 (around 2900 US dollars) after a local court in Kohat rejected his bail plea. Farhan works for Royal TV channel and he says his organization did not help him meet the expenses he made on hiring lawyer in Kohat and also for filing appeal with the Peshawar High Court. “No, there has been no financial support from my organization as I almost spent Rs.100,000 (around 1,000 US dollars) on hiring lawyers’ services,” Farhan said. However, he acknowledged the moral support Royal TV was extending him during the difficult moments keep his arrest story alive in its news bulletin. Police in southern Kohat district of northwestern Khyber Pakhtunkhwa province has charged a TV journalist on seven counts, including anti-terrorism, for “fanning violence” on November 18, 2013. Farhan Ahmed Bangash, reporter for Royal TV in Kohat district, was handed 12 days remand by a judge of anti-terrorism court into the police custody under 7-ATA (Anti-Terrorism Act). He was arrested on November 20, 2013, two days after the registration of first information report (FIR). “I am innocent, and the charges are false,” the reporter told Freedom Network [FN] from Cantt Police Station lock-up via a messenger on Thursday (Nov 29, 2013). “Please help me as the local police are victimizing me for the reporting I am doing,” he said. “The police officer who framed charges against our reporter has had bias against him. We demand independent inquiry into the charges and seek release of the journalist,” the manager demanded while talking to FN. Farhan was booked under different charges, including Sections 436, 380, 427, 295-A, 324, 149 and 7-ATA, according to a police official in Central Police Office in Peshawar. The FIR No 1221 was registered on November 18, 2013, in Kohat City Police Station. “He (reporter Farhan) was later shifted to Cantt Police Station for investigation,” a police official requesting anonymity said. It is unclear why the reporter was shifted to another police station for investigation when “crime” had taken in jurisdiction of the City Police Station. “This case is unique and we demand that facts may be shared with Kohat Press Club, if there is any, as if the charged reporter is found proven innocent at the end of the day the time he spent behind the bars would be compensated by the police,” FN responded to the charges against the reporter. A delegation of Kohat Press Club met Thursday (Nov 28, 2013) senior police official Ishtiaq Marwat discussing the cases against the journalist. “The police official said the journalist has to prove himself innocent as the case in the court of law now,” a member of delegation quoting the police official as saying confided to FN on Friday. District administration had called out the army to help civilian authorities control the situation when supporters of a sectarian group took to the street protesting the violence in Rawalpindi city near Islamabad on 10th Muharram (15 Nov) where the sectarian clashes resulted in killing of 10 persons. A Kohat-based journalist said Farhan was doing stories critical of local police. “I don’t know whether he was spotted among other protestors damaging the property of public property,” the journalist spoke on condition of anonymity. In Pakistan, police usually try to involve a journalist in mass disturbances case for punishment to his anti-police reporting. 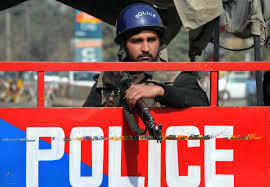 The Kohat police had charged more than a dozen people with taking law into their hands on November 18. Fazal Mehmood, president of Kohat Press Club (KPC), said the police had not shared any evidence against the reporter that he was involved in terrorism that day. “The reporter was covering the clashes as other journalists were doing,” Fazal was speaking to FN. He said the police invited Farhan to City Police Station two days after the FIR registration where he was detained and then shifted to Cantt Police Station. “The police immediately produced him before the anti-terrorism court judge getting six-day remand and then extension for six more days,” the KPC president gave details of the happening. “This is a very serious issue that a journalist was charged under anti-terrorism law. Tomorrow, any other journalist will be treated the same way and we ask the provincial government to look into this case on urgent basis,” Fazal stated. Higher police officials, according to Fazal Mehmood, summoned Assistant Sub-Inspector (ASI) Nazar Abbas, who framed the charges against the journalist, to Police Headquarters in Kohat after framing the charges against Farhan. “This move on part of the senior police officials proves Farhan is innocent and he was falsely implicated in the case,” the KPC president argued.